Johann Friedrich Blumenbach was a founder of zoology and anthropology as a scientifical discipline. His father Heinrich Blumenbach (1709-1787) was a professor at the gymnasium in Gotha. His wife Louise Amalie (1752-1837) was a daughter of Georg Friedrich Brandes (1709-1791). Blumenbach studied in Jena with Carl Friedrich Kaltschmiedt and Johann Ernst Neubauer. He continued his studies in Göttingen and he was promoted in 1775 with "De generis humani varietate nativa". In 1778 he obtained a full professorship in Göttingen. For almost 60 years he lectured on natural history, anatomy and medicin. In 1780 he published "Handbuch Der Naturgeschichte". When he visited England he was allowed to dissect mummies in the British Museum but his research didn't match his own expectations. In 1804 his "Handbuch Der Vergleichende Anatomie Und Physiologie" was published. He was the owner of a famous collection of skulls. 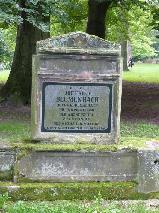 Blumenbach was honoured in many ways. In 1784 he joined the Adacemy of Sciences in Göttingen and in 1793 the Royal Society in London. In 1812 he became a member of the Prussian Academy of Sciences and in a honourary 1826 of the Russian Acedemy of Sciences. He retired in 1835 and died in Göttingen in 1840. The grave of Johann Friedrich Blumenbach at the Albani Friedhof, Göttingen.